When Samsung unveiled the Galaxy Note 7 smartphone back in August, with its much-lauded battery life, the South Korean firm looked like it was on top of the game -- until the phones started exploding making people to start seeing the phone as a potential explosive. Initially, the tech giant cited "battery cell issues" as the cause of the explosions in September and provided a replacement which was deemed safe but all didn't go well as the replacement also started bursting into flames. since then, consumers have been worried on the cause of the fault since Samsung hasn't been able to give a clear statement after the final recall that even came with a $100 reward. Batteries are containers that can convert chemical energy to electrical energy through the transfer of electrons from the negative plate -- or anode -- at one end of the battery to the cathode -- or positive plate at the other end. But traditional batteries have a limited number of units of convertible chemical energy. The difference with the lithium-ion battery is that it is rechargeable -- a game-changer in tech innovation. Steve Levine, author of The Powerhouse: Inside the Invention of a Battery to Save the World explained that it "triggered this whole electronics revolution starting in the beginning of 1990s until today. It has enabled the iPhone, medical devices, wearables, iPads, our thin laptops -- all of that is because of the lithium-ion battery. "Lithium is the lightest metal in the world which is why they use it but it is also extremely volatile, Almost every laptop on the planet, almost every smartphone is a standard formulation which is cobalt-oxide and lithium. But then there are competing formulations." 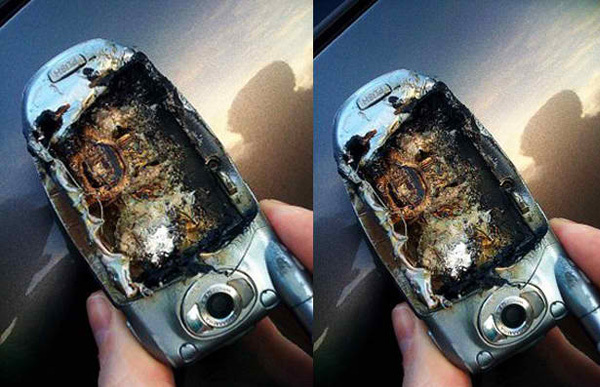 So why do some Phones explode? Levine says speculation among researchers suggests that the battery manufacturing process could be the source of the smartphone fires, but ultimately no one knows. And the lack of information creates consumer anxiety which could ripple out to the wider electronics industries. "It potentially tarnishes all the manufacturers," said Levine. "How do we know that Apple or the new Google phone is not going to have the same problem?" However, some experts say the fact the high-end phone has been discontinued points towards a design flaw. "The discontinuation signals that the root of the problems does not lie in the production errors, but possibly in the product design," TuanAnh Nguyen, a research analyst at Canalys told CNNMoney. Could manufacturing be the problem? This is by not the first time lithium-ion batteries have hit the headlines. Although the Samsung phone's battery is different to those in airliners, Boeing faced similar issues with lithium-ion batteries in their Dreamliner aircraft. Their entire global fleet was grounded in 2013 after multiple instances of overheating batteries in Boston and Tokyo. Investigations by the National Transportation Safety Board determined that manufacturing defects and allegedly unsatisfactory oversight of the manufacturing of the batteries by both the FAA and Boeing were the root causes of the incidents. At least two fatal cargo jet crashes are believed by investigating authorities to have been caused by fires on board as a result of these lithium-ion batteries. In 2010, a Boeing 747 crashed in Dubai, killing two crew members while an Asiana Airlines 747 crashed off South Korea the following year, also killing two crew members. No, according to Levine, who says consumers are not at immediate risk from phones in their pockets blowing up. He said: "We know right now that the problem has been confined to this one model... that it hasn't been something that has risen chronically, at least in any other Samsung device, [or] at any other manufacturer. "So the quick answer is that [consumers] shouldn't be concerned but that doesn't mean they won't be."